Aubrey Nagle, The Triangle. Over 80 different food and drink vendors attended The Food Trust’s latest Night Market event on South Street Aug. 15. 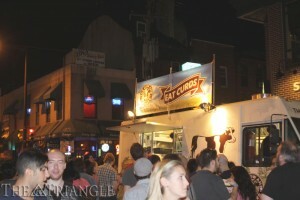 Fair-goers stood in long lines to eat at their favorite food trucks like The Cow and the Curd. Other trucks in attendance included Street Food Philly, Lil’ Pop Shop and BrazBQ. The ever-popular Philadelphia Night Market returned for the third time this year Aug. 15, bringing together over 80 food and drink vendors for a summer extravaganza on South Street. Their largest event yet, Night Market, hosted by The Food Trust, spanned nine blocks from Front Street to 9th Street from 6 to 10 p.m. The pleasant summer weather and usual Thursday night South Street activity brought out visitors in no short supply, creating possibly the largest crowd that Night Market has ever seen. At each end of the event, live entertainment provided a soundtrack to the night on small, intimate stages. ART/GAGE, an annual summer festival held by Philadelphia’s Magic Gardens, curated the live music, including local bands The Late Ancients and New Pony. The bands performed energetic sets that aligned perfectly with the chaotic atmosphere of the Night Market. Other attractions included group art projects reminiscent of the Magic Gardens mosaics and body painting. South Street was incredibly crowded throughout the length of the Night Market. While the environment was extremely jovial and exciting, the overall attitude of every attendee was relaxed. It seemed like every visitor was in a great mood, just enjoying the lights, food and drinks. Sixpoint Brewery was supplying its Bengali Tiger and The Crisp beers to those of age, as the Brooklyn-based beer manufacturer was the featured supplier of the night. Philadelphia Distilling and Penns Wood Winery provided additional beverages. Fortunately for fairgoers there was plenty of food to accompany these beverages. Each block was lined with food trucks on both sides. Every vendor — from the Mac Mart, Hot Diggity, Brauhaus Schmitz and Zea May’s to Lil’ Pop Shop and Little Baby’s Ice Cream — was in attendance, providing foodies with appetizers, desserts and more. The Food Trust pulled out all the stops with its line-up. Never before has such a comprehensive group of food trucks been present in one place. A few Drexel favorites like Street Food Philly and Vernalicious were also in attendance, and every truck had a line reaching down the block. At times it was even difficult to discern where one line began and another ended! Surprisingly, there were many young children attending the event well past 9 p.m., despite the extreme noise level of the crowd and the drunkenness of many attendees. Because the Night Market was held on South Street on a Thursday evening, it was possibly more crowded than usual due to the regular group that visits South Street on the weekends. Unfortunately, this group inhibited one of the most exciting attractions from the Night Market from paying off. It was advertised that a booth at the market would print any Instagram photos marked with the preapproved hashtags free of charge. Of course, many attendees were not only aware of this perk but wanted to take advantage of it, and therefore the photo booth was backed up for hours, keeping many from receiving their prints. While the innovations of holding the Night Market on South Street and the addition of the printable Instagram photos were great ideas in theory, they turned the usually inviting and family-friendly event into one that was overcrowded and definitely less family friendly. The next Night Market will appear Oct. 3 in Chinatown, a spot that has proven successful for the event in the past. Hopefully a spot with less regular weeknight foot traffic will prove useful to the now uber-popular event!